Our History | Swope, Rodante P.A. her maiden brewery was rich with a history all its own. The brewery was to be built on a site adjacent to the Government Spring. The Government Spring acquired its name by 1824 because it supplied the water to the troops sent to the garrison on Tampa Bay known as Fort Brooke. South Florida’s first road was constructed between Fort Brooke and the Government Spring to facilitate the twice daily trip of troops with the water wagon, which provided the entire garrison with fresh water. 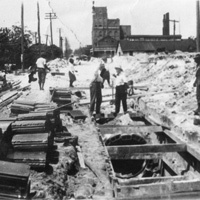 Between 1824 and 1896, when the brewery was built, Fort Brooke was incorporated into the city of Tampa and the area began to blossom into a commercial center. Throughout this time, Government Spring had a number of owners and uses. In 1882, United States President Chester Arthur deeded the land to a woman. After being passed from her hands, for a period the spring was a natatorium and later an ice factory. Then in 1896, a group of leading men, including Vincente Ybor and his business partner Edward Manrara, decided to capitalize on the pure water flowing from the spring and the lack of a local brewery in a town they believed was destined for great things. These men initially organized the Ybor City Brewing Company, a name that was later changed to the Florida Brewing Company. In 1897 The Florida Brewing Company held a large celebration for it’s grand opening. 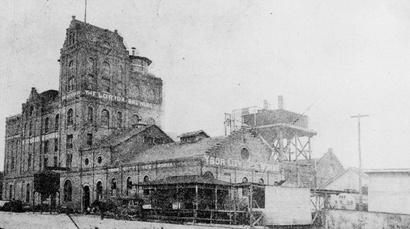 The Florida Brewing Company was a huge success becoming the leading brewery on Florida’s west coast and the largest exporter of beer to Cuba in the United States. The brewery weathered Prohibition, the Great Depression, and a number of competitors until packing its final case in 1961. Between the embargo on exports to Cuba and the opening of a modern Anheuser-Busch factory in Tampa, the brewery, now called the Tampa Florida Brewery could no longer compete. After the brewery closed, the factory entered a slow decline. A cigar company took advantage of the brewery’s thick, brick walls to keep its tobacco leaves fresh. Some of the building’s windows and doors were bricked over when some of the brewery was made into a bomb shelter during the Cold War. By the time the building was purchased by Dale Swope and Joseph Kokolakis in 1999, it was in total disrepair, missing windows, sections of the roof, and even the tower. Regardless of the building’s condition, Swope and Kokolakis were determined to restore the old brewery with its original design in mind. Although unexpected discoveries hampered the progress slightly, in September 2001, Swope Law Group moved into its new home. On September 10, 2001, the Old Florida Brewery was once again home to the humming of machines and the movement of workers. The work and machines are assuredly different, but the attitude of excellence remains.